The history of the Mazzei family is closely woven into Tuscany's winemaking history, as well as this venerated region's political and cultural past. The first recorded mention of the Mazzei family – originally from the winemaking area of Carmignano – was noted in documents traced back to the early 11th century. Today, after nearly six centuries, the Mazzei family (under the guidance of Lapo Mazzei, with the help of his sons, Filippo and Francesco), remains devoted to winemaking, with an eye towards innovation and an abiding respect for the land. A rich history combined with consistently high quality winemaking over centuries has made the Mazzei family like none other and one of Italy's most renowned and respected wine producers. The history of the Mazzei family is closely woven into Tuscany's winemaking history, as well as this venerated region's political and cultural past. The spectacular Fonterutoli hamlet – which includes a cluster of houses, the church of San Miniato and the 16th century family villa – today comprises 470 hectares, of which 79 hectares are devoted to four distinct vineyard sites: Fonterutoli, Siepi, Badiola and Belvedere. The Sangiovese grape finds itself particularly at home in these four areas, which are planted at altitudes varying between 750 and 1,640 feet above sea level, at south and southwest exposure. The rocky limestone and sandstone soil structure, high density planting (7,000 plants per hectare) and low yields of less than 40 hectoliters per hectare result in the production of complex, elegant and powerful Sangiovese wines. Mazzei is considered by many to be the definitive wine producer in the Chianti Classico region, and indeed one of the most prestigious in all Italy. The family produces highly sought-after, critically acclaimed wines from their estate vineyards, each an exclusive and elegant expression of its terroir, and history including the icon family wine, Siepi IGT Toscana - a single vineyard Sangiovese-Merlot blend and Philip – dedicated to the American Patriot Philip Mazzei, and Castello di Fonterutoli. Located just 30 miles south of Florence and less than 8 miles north of Siena, Fonterutoli is the perfect choice for a day visit or a longer, relaxing vacation retreat. 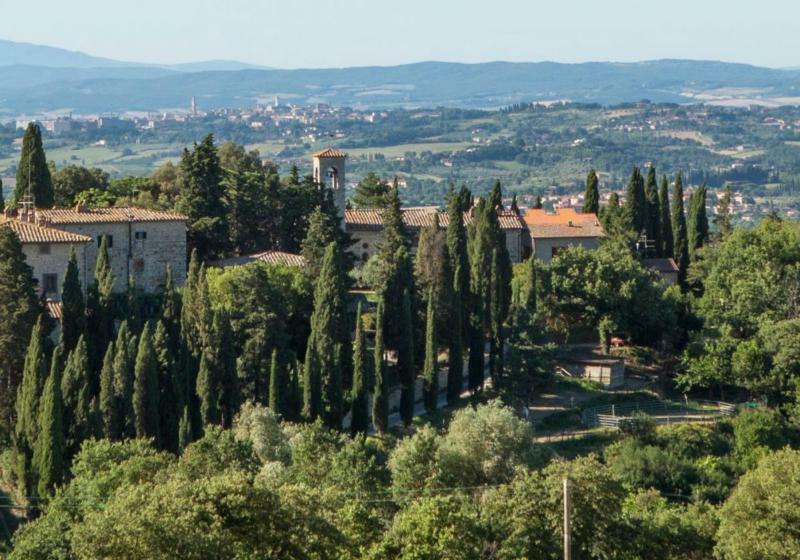 Just off the hamlet's main square, a handful of charming guest accommodations are available for rental; each is furnished in elegant Tuscan country style, and adorned with pieces from the family's personal collection of paintings and antiques. Guests can stroll the cobbled streets and soak in the extraordinary landscape of this quaint village set against a backdrop of rolling hills, vineyards and olive groves. Exquisite dining at Osteria di Fonterutoli enables guests to experience the finest in Tuscan cuisine made from fresh local ingredients while overlooking the vineyards. At Enoteca di Fonterutoli, guided tours of the estate and tastings are available by appointment. James Suckling 90"Aromas of sweet strawberries and flowers. Dark cherries too. Full body, with fresh acidity and a clean finish. Beautiful balance to this red already. A blend of Sangiovese and Merlot. Drink or hold. Excellent value." Wine Spectator 91"Powerful aromas of blueberry pie and black licorice follow through to a full body, with chewy tannins and lots of fruit. Long and structured. Still a little tight. Best after 2010. 6,500 cases made. "~ JS .